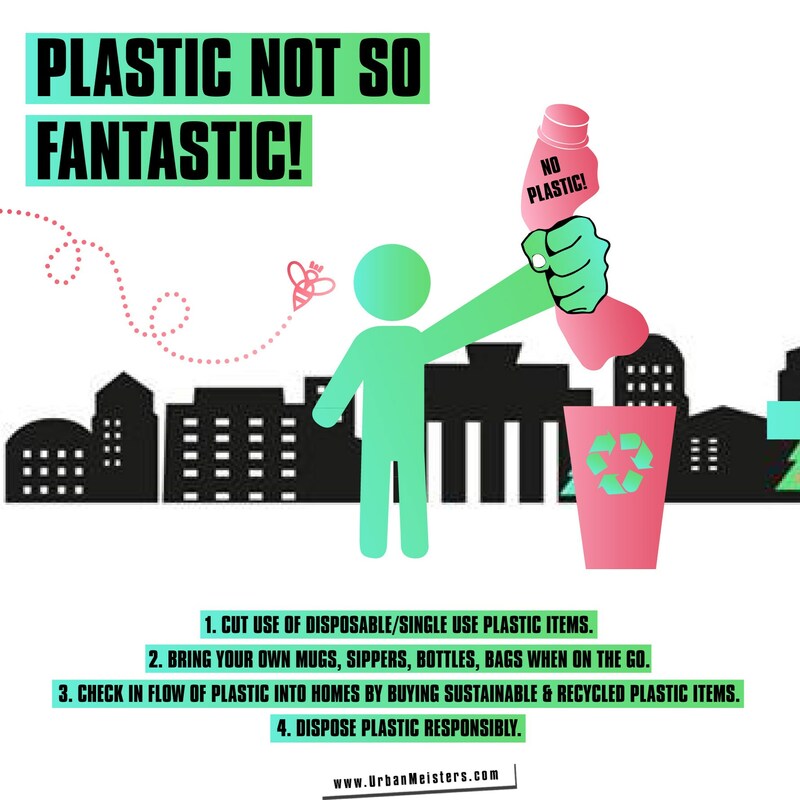 When it comes to plastic we often tend to lack an understanding of its proper use. Plastic as a resource isn’t the problem, in fact plastic as a raw material is more efficient durable and cost effective. The problem lies with it’s over-use & misuse really. According to the Ellen MacArthur Foundation and many other studies, in 2050 there will be more plastic in the oceans than fish, which just goes to show our careless attitude. Cutting daily dependence on plastic is a big step towards reversing this plastic menace. Like carrying your own re-usable water bottles everywhere instead of drinking out of plastic PET bottles! It’s really such a small thing to do but goes a long way in cutting plastic pollution. 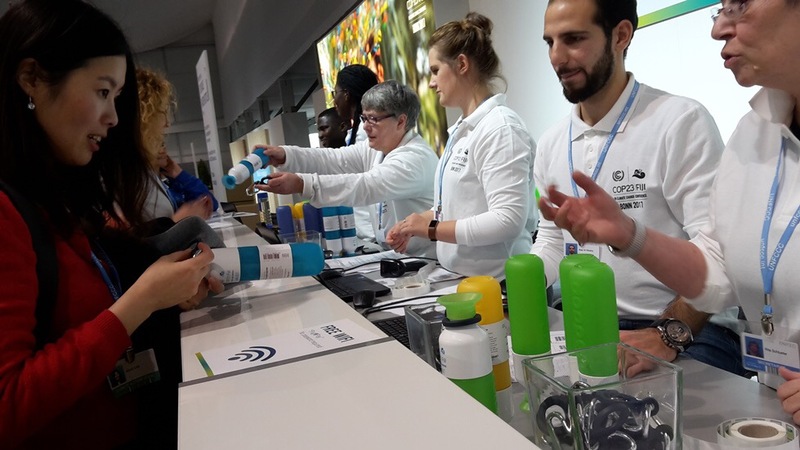 When we participated at the recently held COP23, all attendees were given really cool Dopper re-usable bottles to use instead of plastic water bottles. 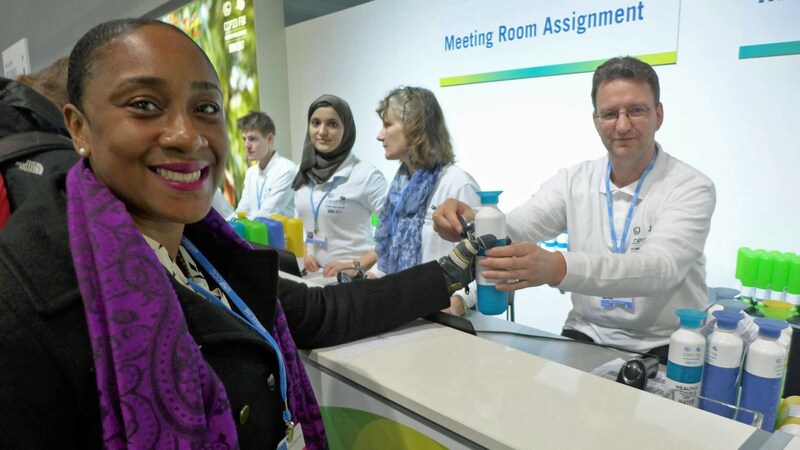 So this is where our founder Mirela Orlovic discovered this super alternative to single-use plastic bottles and our Green Product Hunt radar went beeping! 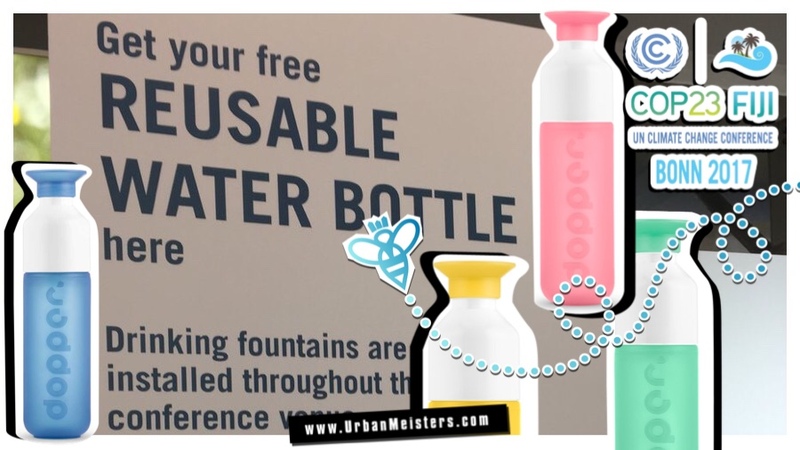 Sign-up to the UrbanMeisters newsletter and win a Dopper bottle. More info at the end of the article. No greenwashing- Dopper re-usable bottles are Cradle to Cradle certified products so no question of their authenticity. Easy to use in everyday life, re-usable bottles are lightweight, easy to fit in bags and carry around. They look way cooler than any of the plastic PET bottles you take around. Slick shape, minimal design and a wide colour palette to choose from- you can match with your outfit everyday! ALSO READ: Is drinking out of Plastic ok? ‘Disposable’ is hardly ever a nice word and when it comes to plastic bottles, it’s downright dirty. Taking this word out our dictionary and everyday life and making us more ‘dope’ instead, are Dopper re-usable bottles. Designed by Rinke van Remortel, these re-usable bottles are the perfect alternative to single use plastic. Let’s see why! Their unique cylindrical shape makes them long lasting and extremely easy to clean. They can be hand washed or washed in the dishwasher (up to 65°C). The bottles are highly efficient as they also come with a cup. They are available is several pop colours and also available in stainless steel thus upping their cool quotient even further. The new artistic designs like the Bridge Dopper- inspired by the Brooklyn Bridge- make it a really cool accessory. Dopper also has some really handy accessories like the carrier and the sport cup that make it even more convenient. Certified product that is produced sustainably- produced in climate-neutral fashion using water and energy responsibly. Dopper is a great proponent of the circular economy. What’s that? It’s the new economic & production model which has become the mainstay of sustainable development globally. This model calls for a complete re-evaluation of the traditional economics of make, use, dispose with not just recycling at the end of the chain but also innovation in design & product development that makes a continuous sustainable cycle. 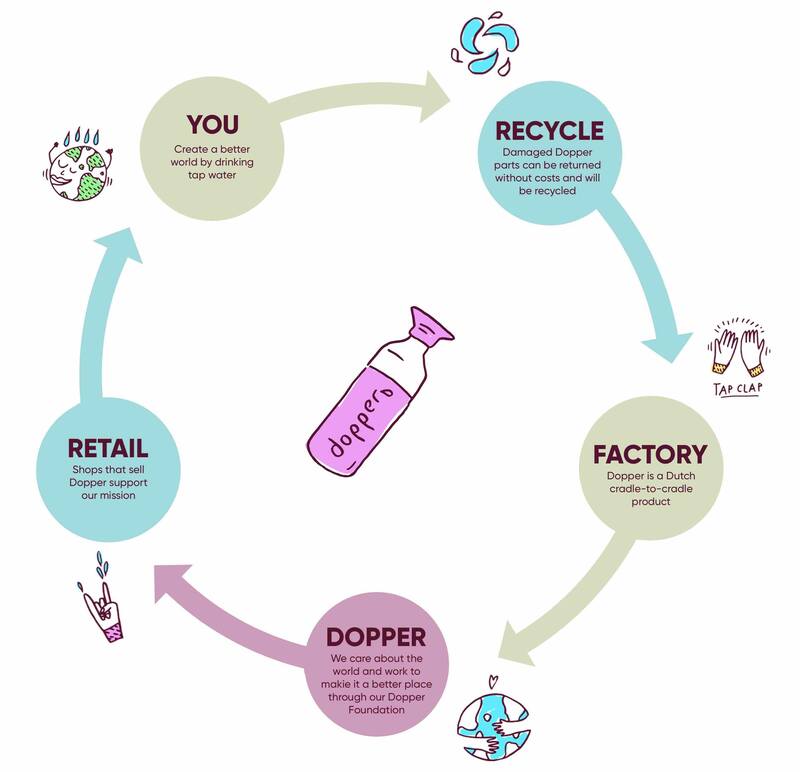 Dopper re-usable bottles are Cradle to Cradle certified company- the very first water bottle company in the world to be actually! At the core of the Cradle to Cradle principle is that at the end of the lifespan of one product, all materials it contains can be usefully deployed for the same or another product. Once your Dopper gets old they can be handed back to the company or other special plastic recycling points for recycling. The company is also supportive of many key drinking water projects and Dopper Foundation backs these projects by using 5 percent of its turnover. 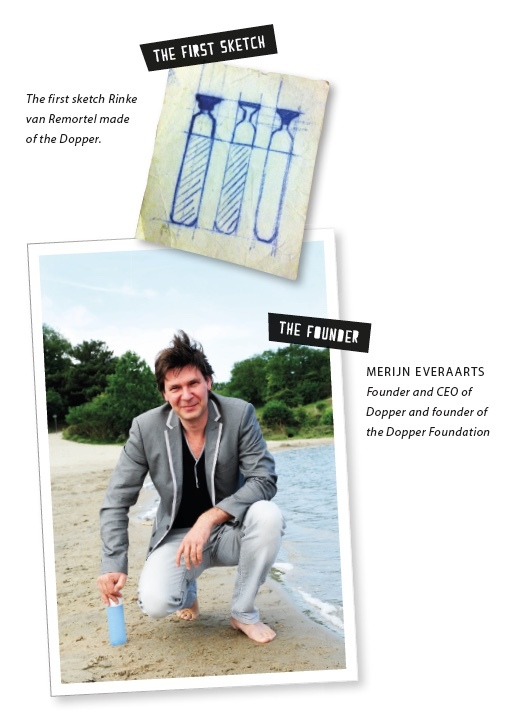 Deeply impacted by his experiences, Founder & CEO of Dopper, Merijn Everaarts decided to change the way people use plastic in everyday life and the obvious starting point seemed how we drink water. 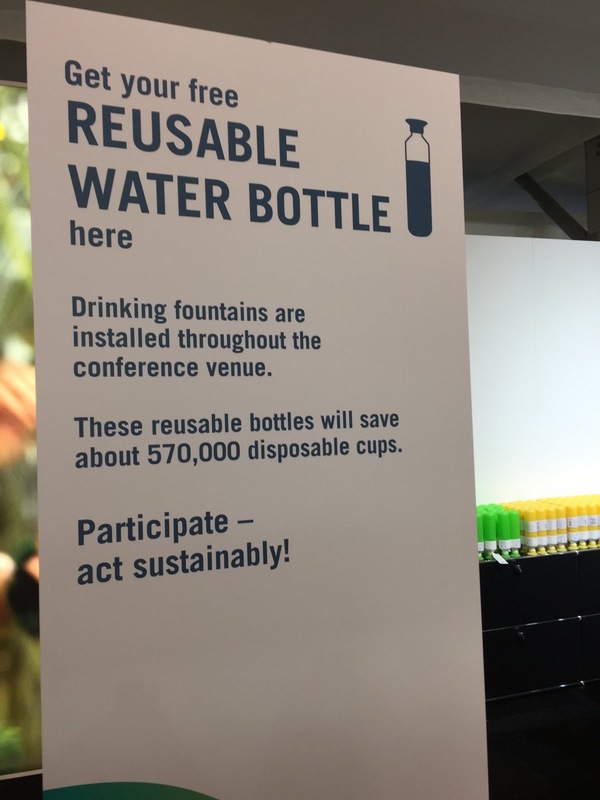 He hosted a design competition to find “the perfect reusable bottle for drinking water.” Through all the 100 entries, Delft University of Technology alumnus Rinke van Remortel’s design won. The design of the bottle was unique and it’s design philosophy perfectly fit Merijn’s idea : Tap water is Number 1- when turned upside down to rest on its cups, it appears as though you’re putting water on a pedestal. The first Dopper Bottle was launched on “Durability Day” in Netherlands in October 2010. Dopper re-usable bottles became an instant hit and now they’re an indispensable part of everyday life in the country. While its a common sight in Netherlands to see people with Dopper re-usable bottles, the aim now is to make it a common sight in the world. This is not Merijin’s only tryst with the plastic problem. Here’s a CEO who’s not only a social entrepreneur but also has a very unique artistic streak. In the most innovative way he brought attention to the problem of plastic over-use, when on World Ocean Day in 2016, he installed a 40 ft tall Plastic Madonna in Rio de Janeiro. It was an artwork of a mother breastfeeding her child made completely out of P.E.T. water bottles. Another art installation was a huge wave made of plastic bottles in San Francisco. 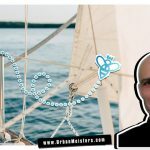 Between May and June 2017, Merijn teamed up with Burning Man artist Colin Hendee and they built a plastic replica of New York’s iconic Brooklyn Bridge next to the East River in New York City using 50.000 single-use plastic water bottles! It is super easy to get your hands on a Dopper Bottle. They’re available to shop online on their website. The bottles are also very competitively priced between $15 for 450ml & $25 for 800 ml. There is a variety of colours to choose from and new additions are always added to the collection like the recent stainless steel Dopper and the Bridge Dopper which is a really cool design. Follow Dopper on Facebook, Instagram and Twitter to keep a tab on their designs and innovations. We’re giving 3 Doppers for FREE! It’s almost Christmas and we’re feeling pleased as punch with our fabulous readers so we have 3 Dopper re-usable bottles as FREE GIFTS for you. Make the most of this chance to ‘WIN’ the amazing Dopper Bottle. 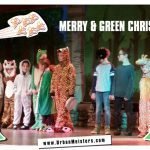 All you have to do is subscribe to UrbanMeisters here before 31/12/17. 3 lucky subscribers will win themselves a fine Dopper! So sign-up here!! Plastic free lifestyle is not that difficult UrbanMeisters. It’s all about getting the steps right and with cool green products like Dopper it becomes easier. You can follow these handy tips.